On 1 October 2008 a new set of rules was introduced which are intended to allow couples much greater ﬂexibility about their choice of parish church. This is because couples often live and work a long way from the parish with which they have personal or family connections and in which they would like to marry. register belonging to a church or chapel in the parish. Of course this is only a brief summary of the rules and there may be other factors that need to be discussed. 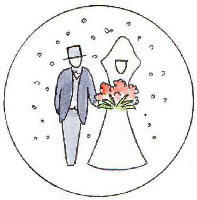 If you would like to discuss the possibility of getting married in church in this parish please do not hesitate to contact the Benefice Co-ordinator.